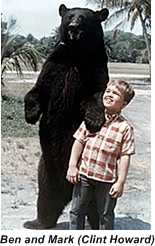 Young Mark Wedloe (Clint Howard) comes across a bear cub in the forest, the cubs mother is then shot by a passing hunter. 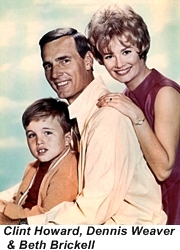 Mark convinces his father Tom Wedloe (Dennis Weaver) who is a park ranger to let him keep and raise the cub as a pet. He names the now 650 pound bear – Ben. Therein lies the crux of the story. Hunters would like to kill Ben so young Mark has to protect him and Ben often returns the favor by keeping Mark safe from all sorts of dangerous critters that they encounter together. Tom the park ranger occasionally has Ben’s help in keeping the Bear River Game Reserve safe from poachers. 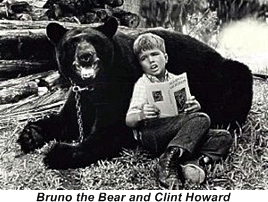 Some of the bear scenes used the real bear, Bruno, for others however an actor (Patrick Newell)in a bear suit was utilized. In sequences where the bear’s thoughts are heard out loud Candy Candido provides the voice. 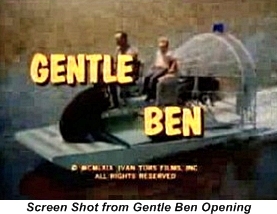 The concept originated in a children’s book of the same name written by Walt Morey in 1965. Cliff Howard is the younger sibling of actor / director Ron Howard. Cliff and Ron’s father also was involved in this show. Actor / writer Rance Howard not only played the Wedloe’s neighbor, Henry Boomhauer he also wrote many of the episodes.